This Wednesday I'm headed up to Boston to photograph the Dalai Lama again, thanks to the Prajna Upadesa Foundation who've invited me to photograph this amazing person three times now. (You can read about the second time I photographed him here.) 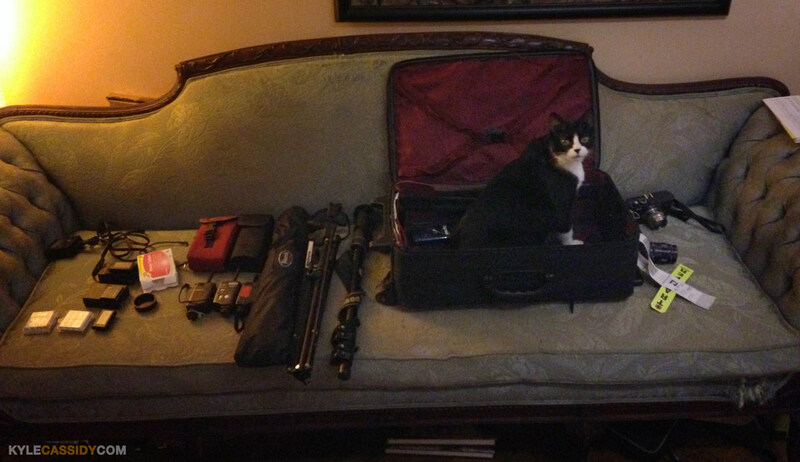 So this morning Roswell and I are up early packing. Packing posts are sort of like unboxing posts in their self-indulgence, but it's what gearheads do. So here's what's going in the bags. 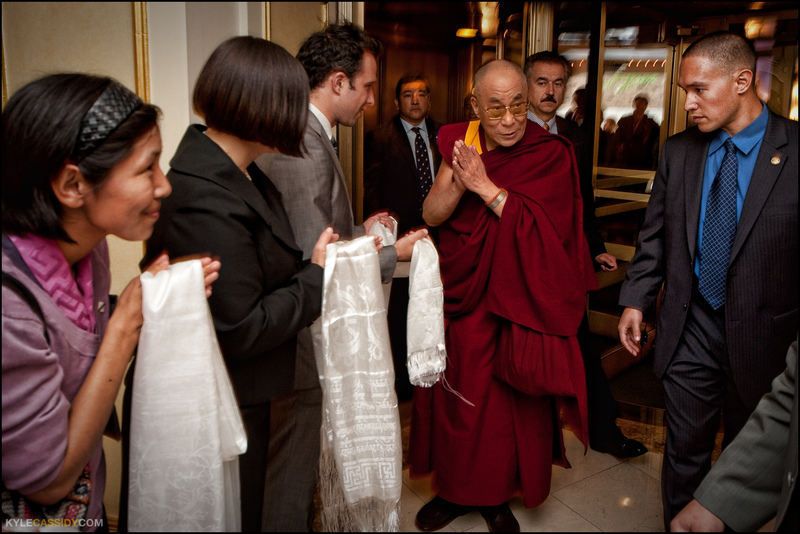 The Dalai Lama arrives, surrounded by U.S. Marshals in 2009. Click to enlarge. You always want to ratchet up your end result from your previous work, so this time I'm bringing three camera systems (ugh). Roswell helping me to pack. Click to enlarge. The Nikon's very fast focusing and it's the most sophisticated, and it's also 36 megapixels which means there's lots of room for cropping. The downsides of the Nikon are that it's big and heavy and noisy. The GX7, while being a micro four thirds camera with a much smaller sensor has a few tactical advantages over the nikon. One is that since it's mirrorless there's a very nice live view with a pop out screen, which means you can frame things with the camera on the floor or up over your head. It's also got a crazy fast frames per second burst mode (might be six or eight fps, I forget, but it's fast) AND it's silent so you can shoot as much as you'd like in a room with people talking quietly and not get in the way. PLUS I can put the Nikon 80-200 on it. I'm bringing the Leica just so I'll have something to talk about with other photographers. While it's a Leica and it's not outclassed by any other camera, it's totally out-performed by the others. It's slow, the focus is odd (and manual). But it's a freaking Leica. I shot a bunch of portraits the last time with an on camera bounce flash which worked pretty well but lighting is the key to everything and an umbrella is better than a bounce flash, and a softbox is better than an umbrella, so you bring what you can and use what you're able. I'm bringing a rolling bag, a Domke "little bit bigger" and a Domke Photogs vest. If only the Nikon didn't make such great photos, I could leave half this stuff at home. Anyhoo. I'll probably be Twittering about it during, so check me out there if you haven't. I may also have time for a Boston meetup Thursday night, lateish. Roswell wonders what the mouse situation is like at Dharamsala. Clickenzee to Embiggen. I'll bet His Holiness could find a nice place for a sweet cat like Roswell! You're fine. A d800 and a macro lens is just what the doctor ordered. It's an incredible setup. Wish I could lend you my Rokinon 7.5f/3.5 fisheye for mft to simplify/lighten your bag. And (while you probably don't need the reminder, but I ran smack into this at Comic-Con, so I tell everyone) in silent shooting mode--watcha banding under flourescents, watcha Lartigueing :). you didn't read the fisheye bit under the panasonic gear! thanks for the heads up on the banding -- i've had that happen a bunch of times and i was bashing my head against a wall because it only happened sometimes. now i know! Ah! You wrote 8mm+Nikon adapter to mft, so I assumed it was the Rokibowyang dSLR fisheye! I squints at gear shot, and now I sees. For the banding, adjust the shutter speed to be slower. It's like video screens, but it's the cycling of the lights. Very interesting shot you got with the US Marshals being so totally on the job.